" It is with profound sadness that the family of Eugene Bohdan Roslycky announces his passing at the University Hospital in London, Ontario on January 4, 2008. He leaves to cherish his memory his children Oleh and Lada, his brother Myroslaw, his sister Olga and brother-in-law Myron Kruk, his special friend Lew Bodnar of Chicago, his Godson Myron Bodnar, his cousin Theresa and many nieces and nephews. Eugene was born May 8, 1927 in Towste, Western Ukraine to Mykola and Felicia Roslycky. He was the middle child. Eugene's education was lifelong and worldwide. His formal education started in the Ukraine and continued through Germany, Canada and the United States where he received his Ph.D in Microbiology in 1960. Although he had many offers to stay in the U.S.A. and work in his profession, he decided to return to Canada and work at the University of Western Ontario in London, mostly for Agriculture Research Canada where he contributed to much ground-breaking work related to genetic modification. Over the years, he was an official Canadian delegate to World Congresses of Microbiologists in Japan, Moscow, Egypt and others. Eugene had a passion for community work on many levels - educational, political and literary. He belonged to the Ukrainian Canadian Congress and was the President of the UCC in London for over 20 years. He was also the President of the Education Commission of the UCC Ontario Council and initiator of the annual festival of the Living Word - Djevoho Slova. As president of the Heritage School Commission of the UCC, Ontario, he was the editor of the quarterly handbook publication Ridnoshkilnyk. He was president of the Commission for the decolonization of the USSR, a member of the Commission for National Rights and of the Ukrainian World Congress. He translated Jerzy Jedrzejewicz's Noce Ukrainskie albo Rodowod Geniusza - a biographical novel about Taras Shevchenko - from the original Polish and published it in Ukrainian as Ukrainian Nights or the Genealogy of a Genius. The Canadian Federal Government bestowed upon him the 125th Anniversary Canada Medal. He was honoured by the Government of Ontario for his many years of committed work to democratic principles and responsible citizenship, and to the promotion and retention of the Ukrainian cultural heritage. The Ukrainian Canadian Congress awarded him with the Shevchenko Medal. For his work in Ukraine after its liberation, the Ukrainian Orthodox Patriarchy in Kiev bestowed upon him its highest honour (even though he was Catholic). He also received a medal from the Ukrainian government for his work on both the political and cultural level. 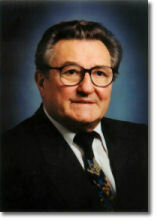 Throughout his life Eugene was involved in ways that he thought would benefit the community, particularly the Ukrainian Canadian community and Ukraine. He authored countless articles, pamphets, papers and other publications in both English and Ukrainian that were educational, political, literary and critical. Although Eugene accomplished much more in life than most people, he still had much to do and many plans and dreams to realize. It was not to be. Man has his plans. God has his. It is time to rest. Farewell-sweet peace! In lieu of flowers the family suggests donations be made to the following charities: Smoloskyp at mbf@smoloskyp.org.ua or Chernobyl Children's Project International at info@chernobyl-international.org. Divine Liturgy followed by Parastas will take place 10:00 a.m. Saturday, January 12 at Sts. Vladimir and Olga Metropolitan Cathedral, 115 McGregor St. with Rt. Rev. Msgr. Mitrat Michael Buyachok and Protodeacon Michael Woroby officiating. Interment will be at All Saints Cemetery. VICHNAYA PAM'YAT! KORBAN FUNERAL CHAPEL 956-2193." Photo, obituary and Ukrainian translation provided by Oleh Roslytzy (May 2009).